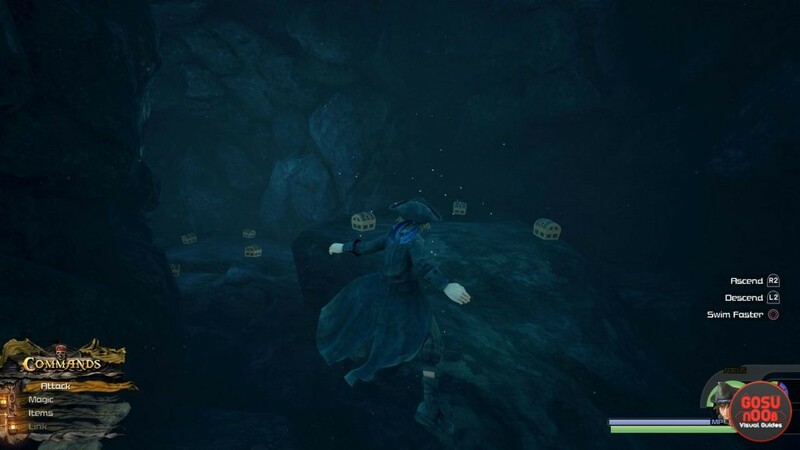 The secret rare synthesis material cave in Kingdom Hearts 3 is an underwater cavern full of chests. All of the chests in the cave drop some kind of rare synthesis materials. These include Adamantite, Orichalcum, and Electrum, and even a Hungry Crystal. So, finding the KH3 secret cave with the rare synthesis materials is really worth finding and exploring. That being the case, here’s our Kingdom Hearts 3 Rare Synthesis Materials Secret Cave Location guide to show you exactly where to find the rare materials cave, and what you can get for exploring it. Where to Find Secret Cave with Rare Synthesis Materials in Kingdom Hearts 3? To find the secret cave full of chests with rare synthesis materials in Kingdom Hearts 3, go to The Caribbean. Specifically, you’ll have to go to Sandbar Isle. From the circular sandbank, hop across the stone pillars and into the wooded area. Head to the left (beware the enemies). You’ll come across a lake nestled inside a huge hole in the ground. Jump inside and swim down. There will be more enemies, so take care of them in order to explore in peace. Once you’re deep underwater, explore the entire cave. There are two side caverns you can go into, one of them being a Caribbean Lucky Emblem. There’s eight chests on the right, two on the left (the Mickey Head) and one more on the pillar in the center of the cave. So, here are the rare materials we managed to get from these chests: one Hungry Crystal, one Storm Anchor+, two Orichalcum, and three Adamantite and Electrum. Plus, some mussles, White Crabs, regular crab meat, and other bits and pieces. So, needless to say, exploring the cave on Sandbar Isle is really worth your while. Of course, there are more ways for obtaining rare materials in Kingdom Hearts 3. For more info on that, check out some of our other guides on the subject, including Soothing & Lucid Gem, Shard, Stone, Crystal Locations, Damascus Locations – Where to Find Material, and Where to Get Adamantite, Electrum & Orichalcum, among others.